Magic Touch Software is proud to introduce the latest innovation in lab technician workflow management. 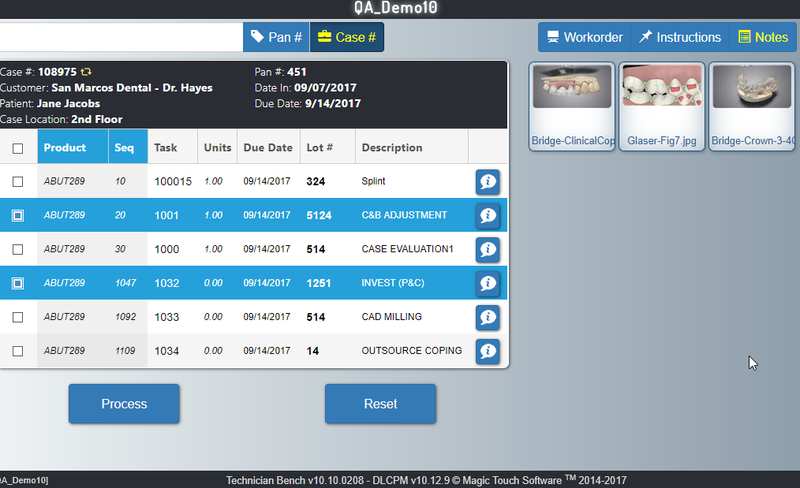 Envision a paperless laboratory, with this new feature application to the Dental Laboratory Customer and Production Management (DLCPM) software – the Technician Bench is a user-friendly application and will allow your technicians to focus on what is important and that is producing the best product. This powerful feature allows technicians the ultimate flexibility in bringing production information right into the palm of their hands when needed. They can log in from any desktop, laptop, tablet, smart phone or any other mobile phone Android or iOS devices to view their assigned task, case schedules, work orders, preferences, images and attachments including design files. Besides viewing all within a consolidated screen in real-time, they can also receive Sent notifications if case elements change and add notes to their cases. This app also Includes Time Clock and Payroll report that functions as a task and piece rate time clock for payroll and reporting purposes. See our options, or go to our contact page to learn more - or to schedule an overview.